These people on top, who basically are of Royal Bloodlines, is currently working on reducing the world population in order to easier maintain their control, and ultimately the strive towards a centralization of power, which will include the whole world. 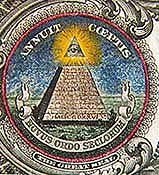 The Illuminati (not to be confused with the Bavarian Illuminati) is a very secretive group of occult practitioners who have been around for thousands and thousands of years and are using the Jewish Cabala as one of their guidelines to oppress the rest of the population. It is not a boys' club or a group of adults trying to get some excitement in life; this is something much bigger and much more sinister. It is an extremely well structured organization consisting of people in very High Places. Those people are the Super Wealthy, who stand above the law. Many of them don't even appear on the list of the wealthiest people in the world - they are that secret. What is driving them is money and power . Of course there is the rumour that there is more to it that they are satanists and awaiting the birth of the anti-christ which by now would have already been born . Also the money rumour that they only marry amongst their own relatives so the money stays in the family . There are so many reports comming in everyday to deny the existance of this group of people any longer.